4″ Display – A larger screened iPhone has been rumored for a long time, but now Reuters, WSJ, and Bloomberg have all piled in with reports that appear to confirm the 4″ display is a reality. Redesigned Case – To accommodate a larger screen the iPhone enclosure is bound to get a redesign. Nobody knows what it will look like or if it will be made of glass, aluminum, liquid metal, or a combination of all three, but with longstanding rumors that Steve Jobs worked on the design before he passed away, you can rest assured it will be beautiful. 4G LTE – True mobile broadband is bound for the iPhone according to a handful of rumors, and with the 3rd gen iPad receiving the 4G treatment it’s a pretty safe bet the iPhone will follow suit. 10 Megapixel Camera – The smartphone is killing the point-and-shoot camera market, and the next iPhone is probably going to include a camera so good that it will drive a final nail into the consumer digital camera coffin. Why 10MP? 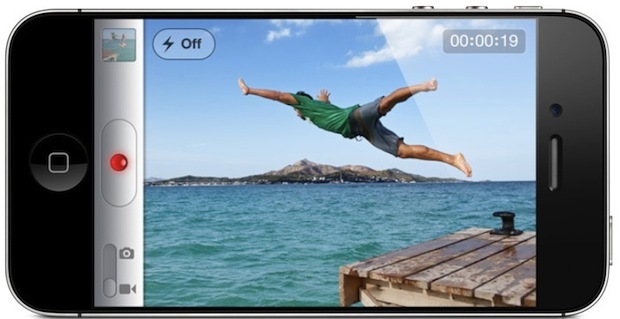 The iPhone 4S has an 8MP camera, so it’s a logical step. A5X CPU & Quad Core Graphics – It’s very likely Apple will borrow the iPad 3 A5X CPU with it’s quad-core GPU and jam all of its power right into the next iPhone. Apple regularly shares core hardware components between iOS devices, so this isn’t particularly outlandish. 1GB RAM – If they borrow the A5X from the iPad 3, it’s very likely the next iPhone will have 1GB of RAM like the iPad too. Apple generally finds specs meaningless, but geeks love this stuff, and 1GB of RAM means faster apps, improved multitasking, and an all-around boost. iOS 6 – Not much is known about iOS 6, but everyone is expecting a big preview at WWDC in just a few weeks. Rumored features include all new Maps app with advanced abilities like turn-by-turn directions, further iCloud integration, third party widgets for Notification Center, third party Siri support, and much more. “The new iPhone” – Taking another page from the book of iPad, the next iPhone probably won’t be called iPhone 5 at all, it’ll be named simply “The new iPhone”. People will still call it the wrong name anyway though. September or October Release Date – The release timeline for new iPhones appears to have shifted from earlier in the year to fall, assuming the next iPhone is released on the same schedule as iPhone 4S was that is. Expect a launch and release sometime in September or October of this year. Those are looking like the most likely features and specs of the next iPhone, but there are also a few other vague possibilities. There is really nothing to support these rumors except analyst claims or web conjecture, so we’ll file these safely under “wishful thinking” while we all cross our fingers hoping they end up true. 32GB Base Model – My iPhone fills up much faster than my iPad, it stores tons of photos and tons of music, and frankly 16GB is just too small to be standard anymore. 32GB, 64GB, and 128GB storage options would be fantastic. T-Mobile – Plenty of T-Mobile customers are using unlocked devices on their network anyway, so hopefully Apple and TMO USA can finally work out a deal to bring the iPhone to their network. China Mobile – The largest cellular carrier in the world with 655 million subscribers, China Mobile has a paying customer base that is two times the entire population of the USA. If Apple wants to continue it’s explosive growth in China, landing a deal with CHL is vital, and this could be the year, and the device, to finally do it. What do you think the next iPhone will have? What should it have? Let us know your thoughts and speculate away. The amount of megapixels DOESN’T make a picture better! Shame on you for continuing on with the megapixel game. yes, its true. but it will makes the images better when cropping. I for one hope they don’t change to Magsafe because my existing cables and dock connectors wouldn’t work! Rico is a bit right about the camera, the sensor matters much more. The MP count will be bumped up in the process. I don’t think Magsafe will happen, alot of adapters or stands for the iPhone, whether it be for desks or for cash need the click in to stop it from moving around. Brushed metal back. Will help in hiding scratches and in general looks awesome. I once read that if a person has a nickname, it means they weren’t given the right name to fit who they are. Apple’s product naming conventions are idiotic. Consequently, people rename them. All sounds plausible. Can’t wait regardless of what comes! Hey Matt – It’s is a contraction for it is. The possessive form is its. “…. with it’s quad-core GPU… should be “its”. Quite frankly, who cares? It is one of those stupid spelling conventions that makes no sense. It is a totally made-up nonsensical “rule”. It isn’t a stupid spelling convention. Despite the opinion of many English speakers nowadays, the rules of the English language, especially those concerning punctuation and contraction of words, make a great deal of sense, and are essential to being able to understand well the message that someone is trying to get across. And no I’m not some 50 year old grammar nazi living in the past! I’m a 22 year old girl who is shocked at how the people of my generation are destroying this language. If you are so shocked try and start your rectification in a better place than a place for discussing the technological advances of this year, and quite frankly I’m shocked that you think that age matters in a matter like this. You can’t just assume that just because some one is senior that they do not possess the ability to convey a message clearly. I don’t think Apple will go for a bigger display. Many reasons for them not to. If there isn’t at least a 4″ screen on the next iPhone I predict that this one omission will cause more people to leave Apple and switch to Android or Windows Phone. I don’t care what the Exulted One Spake a 3.5″ screen is too small in a modern phone. Regardless of whatever size Apple decides on they’ll drag out the corpse to bless it claiming that His Steveness had a large role in developing it. I switched to a Samsung Galaxy S2 and while I had issues and went back to my iP4 I will give another serious look if the screen is not 4″ or greater. I think that with the pattern of iPhone names, iphone 3, 3gs, 4, 4s. I reckon the “new iphone” will be called iPhone 4GS. its a certain that there will be 4G compatability. Heres hoping that there is a 4″ display. With the release of iOS 6, i personally will be looking forward to WWDC and the “iPhone 4GS” release date, later this year. I will upgrade to whatever comes out. Only question for me is to which network I’ll join this time. 10 megapixel camera…yeah great but I’d rather see I slightly larger lens. Battery life should be improved for the higher specs but I doubt it. I hope it will be good. I’d say a 12 MP camera and to really kill the point and shoot ones Apple needs to add an optical zoom with wide lens, even 3x would do wonders. Why 12 MP? Because my SonyEricsson Satio made in 2009 has one, and SonyMobile’s latest Xperia S, and US-bound Xperia Ion also have one. 12 MP phone sensors are old news and Apple is playing catch up in that regard. Wonder what the resolution and the aspect ratio of the 4″ screen will be. If they finally go for 16×9 then the exterior dimensions of the new iPhone may not change much. It’ll be called The New iPhone. However, as it’s the 6th iPhone it wouldn’t be called the iPhone 5 anyway. Everyone seems to ignore this logic. It’s funny. People call it the iPhone 5 because when apple released the iPhone 4s no one really felt they released a new iPhone, more just a slight improvement from the 4. So apparently you are the one that truly doesn’t understand the iPhone logic. Maybe someday it will come to you I hope. Actually, this next one would be the iPhone 7, if you wanna get technical. 6: iPhone 6, but due to the infinite confusion over this numbering, New iPhone seems definitely seems more likely. iPhone 5 is used by sites to hook page hits from search sites like google, and unfortunately simply continue the myth of the ‘upcoming’ iPhone 5, if you have a 4S you have an iPhone 5.
iOS and Android. Need to do 2 major things. 1: lockscreen notifications and social network info and alerts, like Intelliscreen x, and chameleon kickstarter. Intelliscreen x does this really well. 2: the phone dialer app, contacts, text messaging, and social networking apps integrated in one app with a great ui, and swipe navigations. Im tired of opening up different apps to common communication tasks. It’s cumbersome. These are the two major things I would like for both Android and IOS to include in their next major update. No mention of Near Field Communication or it just considered part of iOS6? I think the name will be iPhone 5. I don’t see any reason to keep renaming the iPhone with each new iteration. When Toyota releases a newly designed Camry, they just keep calling it Camry. It is easier for car companies to do that since they go by model year for distinction. Iphone 5 3.99″ display, you couldn’t pay me to own a droid. What dont people understand Apples relese dates? for example the iPhone 4 was released on 24th of June 2010 and over a year later the iPhone 4s was released on the 14th of october 2011 so why would Apple release the nest generation iPhone any less than a year later? Who really cares. Apple have a phone that everyone who has one thinks it’s a status symbol and makes them superior and the masses follow like a herd. Anyone who knows anything realises, that with android you have more options, and apple locks you in. Ever tried copying your songs from a Iphone to a non iphone…it’s a pain if you know how and impossible if you don’t. Try that on an android or windows phone it’s very easy…thats just an example. I wouldn’t buy an IPhone for many reasons and before anyone says I’m an Apple hater….I have a 27″ IMAC that I love…but with phones I’m afraid android wipes the floor…yes the phones may be stylish….but when I need the power of something that allows me to customise they way I work and be an individual…IOS fails. The new retina display! Its in the new pro and iPad, makes sense to me anyways. China Mobile, its 655 million subscribers or 655 thousand ?